So I write one blog and fall off the face of the earth... not a very good start to this new blog. Well I have a few updates. My last blog talked about my plans for my daughter's room. Well, this update is going to be quite anticlimactic. The room is painted. I think it's a lovely mauvey, pinkey, purple color from Behr called Premonition. 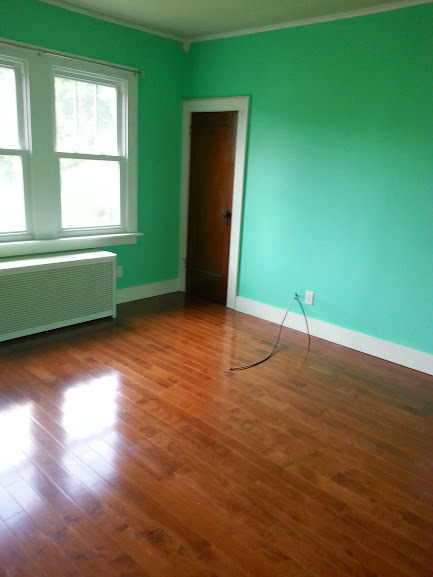 I bought a no VOC paint with primer because the room had previously looked like this! I mean that's a quite bright aqua so the primer in the pain really made the job a one coat plus touch ups. The list of things to do in her room is still quite long, but we're not even living in the house yet so bear with me. To do list:Paintmake fabric covered shadeshang curtains—purchase just need to be hung.have furniture delivered--off the boat from Germany.construct bed-- Let me talk bed construction. I had intended on having a handyman who was doing some work for my mom make the bed canopy thing. Well, his attention to detail and ability to complete work on time and budget is in serious doubt, so I think I'm going to tackle the job myself. I found a cool new little "cutter" it is supposed to cut things up to a quarter of an inch. So I am going to try it out with this bed. I'll buy the 1x1's and have them cut at home depot, I'll also buy a little saw for any smaller cuts that need to be made. For the facade I'm going to be using a thin wall board panel supported by the 1x1's and screwed into the original bed frame. I’m hoping to be able to just put the façade and secure it, I will add the additional frame around the bed if necessary but again we’re going to wait and see on that one. I just think it could make changing the sheets more difficult than it will already be. Onto a subject other than home improvement. Home cooking, meal preparation and packing lunches. I have to admit that I’ve been slacking. I’ve been eating out too much, eating too much processed crap, feeding crappy processed for to my kid, not scrutinizing labels, and giving in to the glutton who lives in my stomach, but apparently doesn’t have a good relationship to his neighbor my gallbladder. So, I’ve started cooking more. Nothing too difficult and still having some processed items, but really trying to be much healthier in my choices and more frugal. Tonight for dinner is a 3 can dinner. You could also make any of this from scratch if you so choose but this is a little dish from my childhood that has just sounded so darned tasty. It’s an open faced cream of tuna sandwich. I know this doesn’t sound FANTASTIC to most people but seriously give it a chance it really is a tasty treat on a night when you want something quick and easy. I find that this recipe also cures a hankering for tuna noodle casserole. Up to 1 can of tiny sweet peas. Toast or bread, alternatively you could have over egg noodles. This is one simple dish. Place all ingredients except bread/noodles in a sauce pan and heat until warm. Pour over your toast (I like mine with a smidge of butter) or noodles and enjoy. I think you’ll be surprised at how tasty this is. What could be done to make this less processed? Fresh steamed peas--- I grew up on canned in this and that’s what tastes right to me. Find what tastes right to you. Homemade cream of mushroom soup—I’ve seen pins of this but never tried it myself. I think if you have the time and energy please do and let me know how it tastes. I’m hoping to be able to start cooking some Venison recipes. Deer season is near here in Central New York and I now know someone who hunts. I’m looking forward to the addition of inexpensive and healthy protein to our diet. Can’t wait to fill the freezer. Until next time. I hope that it won’t be nearly as long.